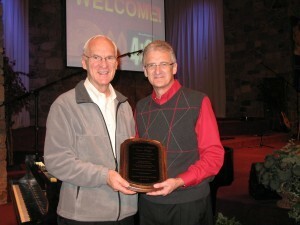 Dr. Ken Bickel (right), on behalf of the Association of Grace Brethren Ministers, this past Sunday morning gave the Excellence in Ministry Award from the AGBM to Roger D. Peugh (left) in the Sunday morning services of the Winona Lake (IN) Grace Brethren Church, where Peugh and his wife, Nancy, are members. The other AGBM annual awards were announced at national conference in July, but Peugh was unable to attend, so the AGBM decided to recognize him in front of his home church. Peugh, originally from the Grace Brethren church in Harrah, Washington, is a graduate of Grace College and Theological Seminary, having earned degrees through the doctorate in ministry. He and his family served 20 years as church-planting missionaries in Germany, and upon their return to the US began 21 years of service at Grace College and Seminary in various teaching and administrative roles.